Vor allem China und Russland sind bisher berüchtigt für Cyber-Attacken auf deutsche Unternehmen. Jetzt greift auch noch der Iran an. Ein Ruhetag führte den Verfassungsschutz auf seine Fährte. Der Eindringling kam lautlos und unbemerkt. Über Monate hinweg hatten die Mitarbeiter eines Industrieunternehmens ihre Arbeit verrichtet und nicht einmal bemerkt, dass sich Fremde am Wichtigsten zu schaffen machten, das ein Unternehmen unterhält: dem Computersystem, in dem alles Know-how gespeichert ist. Stillschweigend bahnten sich die Täter den Weg in die IT-Infrastruktur, gezielt suchten sie nach Schwachstellen, arbeiteten sich schrittweise vor. Als die Firma im April 2014 schließlich erste „Unregelmäßigkeiten im Rechnernetz“ feststellte, hatten die Angreifer bereits ein halbes Jahr lang Zeit gehabt, um die Mitarbeiter auszuspionieren und ihre Passwörter zum Firmennetz abzufischen. Auf der Suche nach Hilfe wandte sich das Unternehmen daraufhin an denBayerischen Verfassungsschutz, dessen Experten sogleich die Fährte aufnahmen. Mehrere Mitarbeiter des 2013 speziell für den Kampf gegen Wirtschaftsspionage gegründeten Cyber-Allianz-Zentrums (CAZ) machten sich an die Arbeit und stießen schnell auf Spuren von Software-Werkzeugen, die die Hacker genutzt hatten, um heimlich in die inneren Sphären des Unternehmens vorzudringen. Doch wenngleich das Aufdecken professioneller Cyberangriffe wie diese für die CAZ-Experten zum Alltag gehört, sorgte dieser Fall für großes Erstaunen. Nach Recherchen von „Welt“ und „BILANZ“ führten die Spuren nicht etwa zu Hackern in China oder Russland – von wo die Mehrzahl der Cyberangriffe auf Deutschland gestartet wird. Die Täter saßen in einem Land, das bis dato nicht eben als Zentrum für Wirtschaftsspionage bekannt war: im Iran. In Iran wird die 26-jährige Reyhaneh Jabbari hingerichtet. Sie wurde 2009 zum Tode verurteilt, weil sie den Mann erstach, der sie nach eigenen Angaben vergewaltigen wollte. Aufnahme von Flüchtlingen, zum Beispiel bei den Kosten der Gesundheitsversorgung. zur Beschleunigung von Asylverfahren beitragen sollen. Flüchtlingen ist nicht nur eine Aufgabe von wenigen, sondern von allen EU-Mitgliedstaaten. On Sept. 30, Brig. Gen. Moussa Kamali, Iran’s chief conscription officer, announced that compulsory military service in Iran will be extended from 21 to 24 months. Military service has been a point of conflict between the youth and the establishment over the past three decades, ever since the 1979 revolution. All Iranian males are required to report for military service at age 18. However, college students can receive a temporary educational exemption, while others can seek exemption for medical reasons or if they need to care for elderly parents. According to statistics, each year about 2 million students graduate from universities in Iran. Unless they have obtained a temporary or permanent exemption, they are required to report to a military service center within a year after graduation. Failure to do so results in an additional three to six months of service. In 2009, the army shortened military service to 18 months. Service time was further shortened for men with bachelor’s, master’s or doctoral degrees to one to three months. In 2012, however, military service was set at 21 months for all citizens. Now, from 2015, it will increase to 24 months. Mehdi Karroubi, a candidate in the 2009 presidential elections and a Green Movement leader, said that reforming the military service law would be a priority if he were to be elected. According to his proposed plan, military service would be made into a profession in Iran. Those who abstain from service would be required to pay a fee and take part in a 60-day training program. In 1999, the Iranian parliament passed a proposal allowing Iranian men to pay a fee to exempt themselves from military service. The amount, depending on the applicant’s education level, ranged from 1.3 to 2.5 million tomans ($1,600 to $3,100). The conservative faction criticized this proposal, calling it discriminatory against the less affluent. By the end of the year, the proposal was completely dismissed. After the West imposed sanctions on Iran, the country’s income level, which mostly comes from the oil industry, radically decreased. As a result, the army’s allocated budget has subsequently decreased over the past three years — a reality that has affected soldiers’ salaries and living conditions in the garrisons. Yet, last October, Tehran member of parliament and former Sepah commander Esmaeil Kowsari told Tasnim News that there was no budget allocated for this issue. According to officials in the Military Service Organization, soldiers’ salaries range from 100,000 to 110,000 tomans per month ($30 to $35). Aside from this, soldiers do not have suitable living standards. Some believe the service-extension decision was made in relation to the Iranian government’s recent policy of encouraging parents to have more children. Mit größter Besorgnis erfüllen mich Berichte über den kritischen Gesundheitszustand der neun inhaftierten Anhänger des Nematollahi-Gonabadi-Ordens. Diese waren aus Protest gegen anhaltende Repressionen gegenüber Angehörigen der religiösen Sufi-Minderheit in Iran vor einem Monat in Hungerstreik getreten. Iran hat sich mit der Ratifizierung des Internationalen Paktes über bürgerliche und politische Rechte verpflichtet, auch das Menschenrecht auf Religions- und Weltanschauungsfreiheit zu achten und zu schützen. Die Unterdrückung religiöser Minderheiten steht dazu in eklatantem Widerspruch. Ich fordere Iran auf, seiner Verpflichtung nachzukommen, die Menschenrechte Aller unabhängig von religiöser oder ethnischer Zugehörigkeit zu achten und alle Personen, die aufgrund ihrer religiösen oder politischen Weltanschauung inhaftiert sind, unverzüglich frei zu lassen. Darüber hinaus appelliere ich an alle Verantwortlichen in Iran, den Hungerstreikenden umgehend dringend benötigte medizinische Behandlungen zu gewähren. Die Situation für ethnische und religiöse Minderheiten in Iran ist besorgniserregend. Während Juden, Christen und Zoroastrier laut der iranischen Verfassung als religiöse Minderheiten anerkannt sind und zumindest offiziell Religionsfreiheit genießen, werden Angehörige mystischer Orden innerhalb des Islams (z.B. des schiitischen Nematollahi-Gonabadi-Ordens), auch Sufis oder Derwische genannt, häufig diskriminiert oder durch gewaltsame Übergriffe an ihrer Religionsausübung gehindert. Anfang September 2011 gab es schwere Übergriffe der Sicherheitskräfte in vielen Landesteilen, v.a. in Kavar, im Zuge derer eine Vielzahl von Sufis sowie Mitarbeiter der zum Nematollahi-Gonabadi-Orden gehörigen Website „Majzooban-e-Noor“ und deren Verteidiger festgenommen wurden. Neun der Inhaftierten – zu Haftstrafen von viereinhalb bis zehneinhalb Jahren verurteilt – sind aus Protest gegen die andauernde landesweite Verfolgung des Nematollahi-Gonabadi-Ordens und gegen die schlechten Haftbedingungen am 31.08.2014 in Hungerstreik getreten. Es handelt sich um die im Teheraner Evin-Gefängnis inhaftierten Omid Behrouzi, Mostafa Daneshjou, Afshin Karampour, Farshid Yadollahi, Mostafa Abdi, Reza Entesari, Amir Eslami, Hamidreza Moradi Sarvestani sowie Kasra Nouri im Nezam-Gefängnis Shiraz. Ihnen wurde u.a. „Propaganda gegen das Regime“ und „Handeln gegen die nationale Sicherheit“ vorgeworfen. The following piece was written by an Iranian citizen journalist on the ground inside the country, who writes under a pseudonym to protect his identity. A patient lies in hospital. Outside, family members spend the night on the street, staying in a tent on the sidewalk or an alleyway near the hospital. For many Iranian families, forced to travel to strange, faraway cities to find medical care for their loved ones, this is a common experience. The uneven distribution of hospitals and medical services in Iran mean that, in many cases, people from small towns and villages must travel to big cities for medical treatment. Hospitals in cities including Tehran, Shiraz, Tabriz, Mashhad, Isfahan and Ahvaz regularly host patients from towns and villages in the surrounding vicinity. But there’s no one to host those traveling with the patients, and they cannot afford to pay for hotels, hostels or even the modest accommodation fees hospitals charge those accompanying a patient. So, until the patient is discharged, they sleep on the streets. A walk near public hospitals in Tehran — such as Shari’ati, Tehran Heart Center, Shahid Rajaei and Imam Khomeini — paints a clear picture. The practice has been going on for years. It has not escaped the attention of the media, though it only features in the news from time to time. Every now and then government officials make promises to solve the problem. In autumn 2012, Mehr news agency ran the headline “Deputy Health Minister Promises to Solve the Problem of Lodging for Patients’ Companions” after Dr. Hassan Emami, Deputy Health Minister in charge of medical services, issued a statement. “The question of patients’ companions has turned into a complicated problem at state-run hospitals,” he told the agency. “When it comes to services provided by nurses, medical assistants and paramedics, hospitals are short-staffed so they ask the help of people who accompany the patients. Of course, this disrupts the administration of the hospital.” Referring to a scheme that was originally set up in 2005 and aims to provide medical services for localities with a population of under 20,000, Emami said “with the implementation of the Family Physician Program, the number of people who come to big cities like Tehran would decrease and the question of lodgings for companions would be solved.” Dr. Emami added that “if there are enough medical assistants and paramedics in the hospitals, the number of companions who come to the hospitals would diminish.” He also mentioned that charities set up projects to achieve this goal too. But it has been two years since Ahmadinejad’s Deputy Health Minister made those promises. Now there is a new president and a new administration. Health Ministry officials have changed. The success of the Family Physician Program is questionable at best, and charities have done nothing noteworthy. The problem of family members forced to sleep outside hospitals is still persistent. I went to Shari’ati Hospital and wandered in the nearby streets to get some firsthand accounts. A few families have set up camp on the sidewalk opposite the hospital, waiting until their family members are released. One family is from the western province of Kurdistan that borders Iraq: a mother, two sons and a young daughter. Their father has acute pulmonary problems and has been hospitalized for a week. And for a week, they have been camping, living in a tent and taking turns to attend their father at the hospital. They say they don’t know anybody in Tehran and they cannot afford to pay for lodging. A little further down there is a family from the North Khorasan, which borders Afghanistan. The stories are similar. The only differences are the types of illness and the color of the chadors the women wear. Hospital guards do not allow families to set up tents on hospital grounds, so they turn to the sidewalk, using it as a place to sleep, rest, cook and maybe daydream occasionally. But there’s less than six months before the end of the calendar year. It’s not known whether the mayor’s promise will be fulfilled. But whatever happens, in the meantime, families who bring their sick members to big cities for medical treatment have to cope with two heartbreaks: the sickness of their loved ones and being strangers in a strange place by themselves, without any shelter. Now that the world’s headlines are dominated by ISIS, and while Iran’s President Hassan Rouhani is at the UN, Iran is using these distractions to step up its executions, its mass-arrests of minorities, and now its execution of Ayatollah Boroujerdi — that is if Iran, by again withholding crucial medical attention, does not passively execute him first. Iran’s Prosecutor of the Special Clerical Court, Mohammad Mohavadi, stated that the punishment for these crimes of „anti-government views“ is execution, and said that all those who had a hand in publishing Boroujerdi’s book will also be killed. When Boroujerdi suggested an open, public debate, Mohavadi announced that his office did not participate in debates, just trials and punishments [executions]. The regime has been trying to kill Ayatollah Boroujerdi for the past 8 years of his 11-year prison sentence. The threat of execution comes only one day after Ayatollah Boroujerdi’s latest letter to U.N. Secretary General Ban Ki Moon. 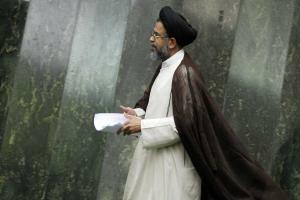 Days before Iran’s President Hassan Rouhani addresses United Nations General Assembly, Ayatollah Hossein Kazamani Boroujerdi, the prominent dissident clergyman was informed that he will be executed for „anti-government views“ — that is if Iran, by again withholding repeatedly-requested medical attention, does not passively execute him first. According to reliable sources inside Iran, „Ayatollah Boroujerdi’s health condition is worse than ever, and prison doctors have said that if the prisoner does not receive immediate medical attention, he will die within days or even hours….“ The authorities have been refusing medical intervention. The Human Rights and Democracy in Iran Agency reported that on September 23, 2014, Mohammad Mohavadi, prosecutor of the Special Clerical Court visited Ayatollah Boroujerdi in Ward 325 of Evin prison. Mohavadi informed him that the contents of Boroujerdi’s book were „heresy“ against the leadership and insulted the Supreme Leader of Iran. This threat of execution comes only one day after Ayatollah Boroujerdi’s latest letter to UN Secretary General Ban Ki Moon was published, on September 22. In this letter Ayatollah Boroujerdi strongly criticizes the government of Iran for mishandling the country’s economy, through corruption and by financing causes in other Muslim countries, instead of spending money on its own citizens, addressing unemployment, rampant poverty and the desperate need for health care. Boroujerdi, who has an enormous number of supporters and is known worldwide as „Iran’s Mandela,“ has also implored the United Nations to help the people of Iran for the sake of history and future generations. However, now that the world’s headlines are dominated by the beheadings, mass-murders and lightening expansion of ISIS, Iran is using these distractions to step up its executions and mass-arrests, and to arrange the imminent murder of Ayatollah Boroujerdi.